The Buffalo Bisons today announced that OF KEVIN PILLAR has been named the team's Stan Barron Most Valuable Player for the 2014 season. The Herd also named RHP BOBBY KORECKY its Warren Spahn Most Valuable Pitcher prior to Fan Appreciation Night on August 26 against the Pawtucket Red Sox. RHP KYLE DRABEK was awarded the Judge Michael Dillon Comeback Player of the Year while RHP MIKE NICKEAS was voted the Joe DeSa Most Inspirational Player Award by his Bisons teammates for a second consecutive year. LHP RAUL VALDES was awarded the Jimmy Griffin "Hometown Hero" honor for his excellent play at Coca-Cola Field and INF RYAN SCHIMPF received the Frank J. Vallone Community Service Award. The Joe Byron Fan of the Year Award was given to longtime season ticket holder and Bisons Booster club member JIM McGOWAN of Hamburg, NY. Named after Stan Barron, a legend in Buffalo broadcasting, this award is given to the player who demonstrates outstanding ability, good sportsmanship and dedication. PILLAR has only played 100 of the Bisons' 135 contests, but still ranks in the Top 5 of many of the league's offensive categories. He ranks 1st in the IL in doubles (39), 3rd in batting average (.323) and extra-base hits (52) and 5th in slugging pct. (.509) and stolen bases (27). He owns the longest hit streak in the IL this season, hitting in 21 straight games July 25 - August 14 (.384, 33-86). He also had an 18-game hit streak, April 17-May 6, and was twice named IL Batter-of-the Week (May 4 and August 3). 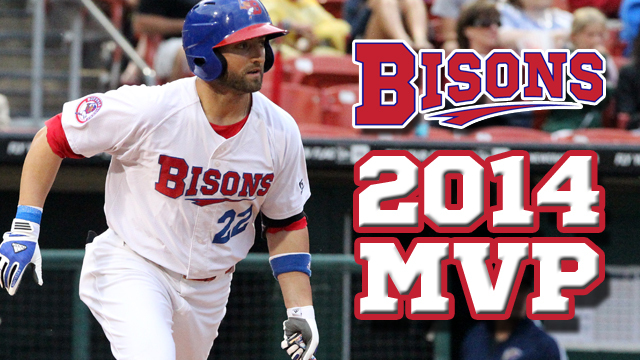 Pillar also tops all Bisons players in his (131), multi-hit performances (35) and RBI (59). His 39 doubles are the 2nd most in a single season in the Bisons modern era behind only Peralta's 44 doubles in 2004. He has a pair of four-hit games this season (April 28 vs. Louisville and July 9 in Rochester) and stole three bases on two separate occasions (June 27 vs. Columbus and July 27 vs. Lehigh Valley). Pillar has been promoted to Toronto three times this season, including earlier today. Overall he has hit .226 (9-40) with three doubles, two RBI and six runs scored in 26 big league games. Established in 2001, this award is presented to the Bisons' pitcher who demonstrates outstanding ability, good sportsmanship and dedication throughout the course of the season. RHP BOBBY KORECKY has been the league's top reliever all season, posting a 2.07 ERA as well as a 5-3 record in 52 appearances (2nd in IL). His 20 saves are tied for the league's top mark and have come in only 22 opportunities (91%). He leads the league in games finished (38) and has allowed the 3rd fewest baserunners per nine innings (9.44) among all IL relievers. Korecky began his season with 17 consecutive scoreless appearances (26.0 IP), not allowing a run until May 17. He earned two saves on the same day, closing out Buffalo wins of 5-3 and 7-4 in a doubleheader at Columbus on June 19. He was also a mid-season International League All-Star and pitched 0.2 innings in the Triple-A All-Star Game in Durham in July. Korecky has also received two promotions to Toronto, allowing three runs over 3.1 innings in two games (4 H, BB, 2 SO). This award is named for the late Judge Michael F. Dillon, who was a three-time Erie County district attorney and served a 14-year term on the State Supreme Court. It recognizes an individual who overcomes injury, personal problems or a rough season and exemplifies the meaning of hard work and dedication. RHP KYLE DRABEK made his Bisons debut in 2013, but pitched just 45.1 innings last season as he recovered from his second 'Tommy John' surgery. Back healthy, Drabek has been a workhorse in the Bisons' staff, logging the 2nd most innings (97.0) of any Buffalo pitcher. On the season, Drabek is 7-7 with a 3.99 ERA in 13 starts and 17 relief appearances. His 67 strikeouts are 3rd best on the club. He began the season in the rotation and allowed three earned runs or less in 10 of his 13 starts. He worked eight scoreless innings in a victory on May 22 in Louisville and struck out seven in six innings of in another victory on May 10 in Charlotte. He was moved to the bullpen in mid-June and tossed five scoreless innings to earn a victory on June 18 in Columbus in his first action as a reliever. Since the All-Star break, Drabek has posted a 3.38 ERA in 11 relief appearances (13.1 IP), earning himself a promotion to the Toronto Blue Jays last week. The Community Service Award is named for the late Frank J. Vallone, the Bisons good will ambassador and most celebrated fan who served as a host and ticket salesperson from 1987-1990. The award is presented annually to the player who best represents the club in community related activities, charitable and youth oriented activities. The 26-year old INF RYAN SCHIMPF has been at the heart of the Bisons community relations efforts in 2014. He shared his love for the game of baseball with the players of Grand Island's Miracle League and taught the future stars of Western New York and Southern Ontario and multiple Bisons youth clinics. In his first season in Buffalo and at Triple-A, Schimpf has quickly become a fan favorite among Bisons fans. Schimpf began the season at Double-A New Hampshire but has played 60 games for the Herd this season. He has hit .194 (37-191) and ranks fourth on the Bisons with nine home runs. Schimpf also has 21 RBI and 27 runs scored while committing just four errors in the field. The Joe DeSa Award is named for the slick-fielding, power hitting player who was with the Bisons from 1985-86. He lost his life in a car accident in December of 1986. The award, which is voted on by his teammates, is presented annually to the player who truly exemplifies the meaning of inspiration by his play and love of the game. C MIKE NICKEAS, who has been a part of the Bisons in each of the past six seasons, joins catcher Tim Laker ('02, '06) and pitcher Jeff Harris ('07, '08) as the only two-time winner of the Most Inspirational Player award (also given honor in 2013). Nickeas has spent the entire season with the Bisons and has been a true leader both on the field and in the clubhouse. He has caught more games (45) than any Buffalo backstop in 2014 and has been instrumental in the development of the great young pitchers in the Blue Jays system. Herd hurlers have posted a 3.38ERA with Nickeas behind the plate and the Bisons are 26-19 when he starts. In 47 total games, Nickeas has hit .206 (29-141) with two doubles, three home runs, 17 RBI and 12 runs scored. He homered in back-to-back games for the Herd, June 8 and June 10 against Syracuse, driving in two runs in each contest. The Hometown Hero Award was created during the 2008 season to honor the impact and support of the former Mayor of Buffalo, Jimmy Griffin. There was no bigger supporter of the team and of a downtown ballpark for the fans of the area than Mayor Griffin. He pledged his own money to have professional baseball return to Buffalo and later proved to be an innovator by insisting on the creation of Coca-Cola Field in downtown Buffalo. The award is given to the player who performs the best in home games in front of the fans of Buffalo. One of the most versatile arms in the Bisons pitching staff, LHP RAUL VALDES has made six starts and six relief appearances at Coca-Cola Field this season, posting a 4-2 record and a 2.84 ERA. In 44.1 innings in front of the hometown faithful, the southpaw has allowed just 43 hits while striking out 42 batters. Three times this season, Valdes has been asked to take the ball on short rest, including July 2 at home when he struck out a season-high seven batters in only 4.0 innings of a 3-1 win over Scranton/Wilkes-Barre. On the season, Valdes is 4-5 with a 3.89 ERA in 21 appearances and 10 starts. He ranks 2nd on the club in strikeouts (71) and is 4th in innings pitched (71.2 IP). He has held left-handed hitters to a 233 average (17-73) with no home runs and a .301 slugging pct. The Fan of the Year Award is named for the late Joe Byron, who is best known for singing the Canadian and US National Anthems at Buffalo Bisons baseball games and Buffalo Sabres hockey games. The award is presented each season to the person who best represents fans through their dedication to the team and to baseball. JIM McGOWAN has been a Bisons season ticket holder every year since Coca-Cola Field opened in 1988 and can always be found in the front row behind the Bisons dugout in section 106. He possesses a great wealth of knowledge on the game of baseball and has visited every major league and minor league ballpark at least once (and many of them twice). A Bisons Booster Club member since 1985, McGowan has served on the Booster's Board of Directors since 2000 and has coordinated the group's volunteers that hand out the Bisons' promotional giveaways at ballpark gates.. Prior to retiring, McGowan was a principal in the Cleveland Hill School District, an Assistant Principal at Baker Hall and an Administrator and Principal at Hopevale School for over 15 years. He delivers Meals on Wheels in Hamburg every weekday and is known as "Every Day Jim" among meals on wheels volunteers and recipients. McGowan currently resides in Hamburg with his wife, Carole.